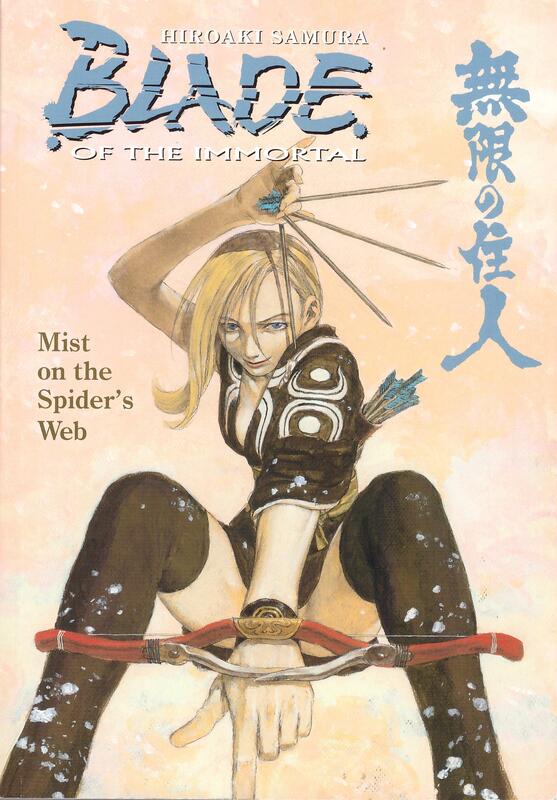 In terms of time Mist on the Spider’s Web picks up only a short while since the end of Blizzard, but a now almost recovered Manji and a still ailing Rin are well enough to move on. They’re barely seen beyond the opening chapter, however, which concentrates on several others on the road out of Edo to Hitachi, and many of them have an agenda. The surviving Ittō-ryū members for a start. They’re well aware they’re being hunted, and have taken precautions. Habaki and his band of Rokki-dan death row convicts are not long behind them. As ever with Blade of the Immortal, though, it may sound relatively simple, but it’s not. 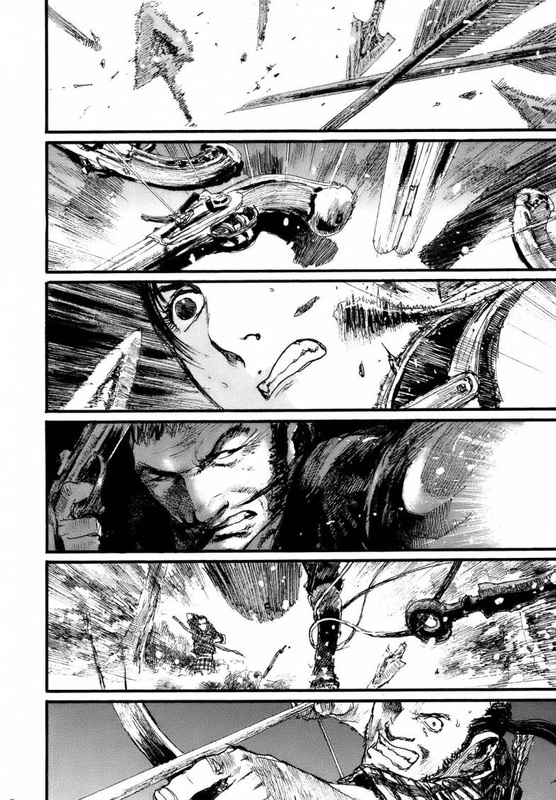 Hiroaki Samura’s is astonishingly good at throwing in both surprises and ethical questions. Some of the surprises are remorselessly logical given the way things have been set up, but Samura has a narrative sleight of hand that prevents realisation. It’s a trick he pulls again in the opening chapter. That features a rare appearance of a primitive pistol in the series. With guns of assorted types the weapon of choice for so long in the real world, it’s interesting to see their use being considered unreliable and far inferior to a sword. The gunslinger is designed as a homage to Clint Eastwood, wearing a poncho and chewing on a cheroot, although an elaborate moustache prevents the homage being too obvious. Bows and arrows also feature. This is all for good reason as Samura again makes us gasp in astonishment at the clever trap set. Compared with the previous outing the violence has been toned down considerably, but there are still a couple of sequences imaginatively gruesome and explicit enough to earn an adult rating. They come surprisingly after Samura has built up the tension. That’s helped between books by the last four Blade of the Immortal collections ending on a form of cliffhanger or with one chapter left before a convenient story break. That’s not Dark Horse being awkward, but the way Samura constructed the original serialised chapters, ensuring more shock or surprise endings as he hit the final stretch. Interestingly he still has a place for new characters, even as more of the old return. The four cat and mouse chapters of ‘Pots’ are excellent, but the book’s last quarter has the feeling of marking time, of ensuring people are delayed in a certain place so that others can arrive. We’ll see in Raining Chaos.